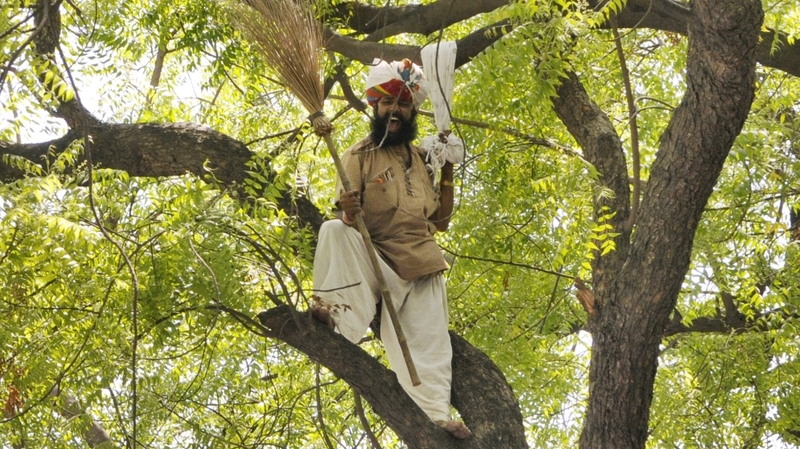 Gajendra Singh, a farmer from Dausa (outside Jaipur) committed suicide by hanging himself to death during a rally held by the Aam Aadmi Party (AAP) in New Delhi on April 22, 2015. AAP calls it suicide and villagers call it foul play. A police FIR (First Information Report) has been filed against AAP members stating that they instigated Gajendra to commit suicide and prevented the police from helping the distressed farmer. Gajendra was a hard working man who worked at his father’s farm for part of the year, and earned extra by tying colorful turbans in Hotels for the remainder of the year. He managed his life well and was looking forward to his cousin’s wedding in the upcoming months. He told his family he was planning on attending the AAP rally, and would prepare for the wedding upon his return. But he didn’t return, and the mystery surrounding his death baffles us. 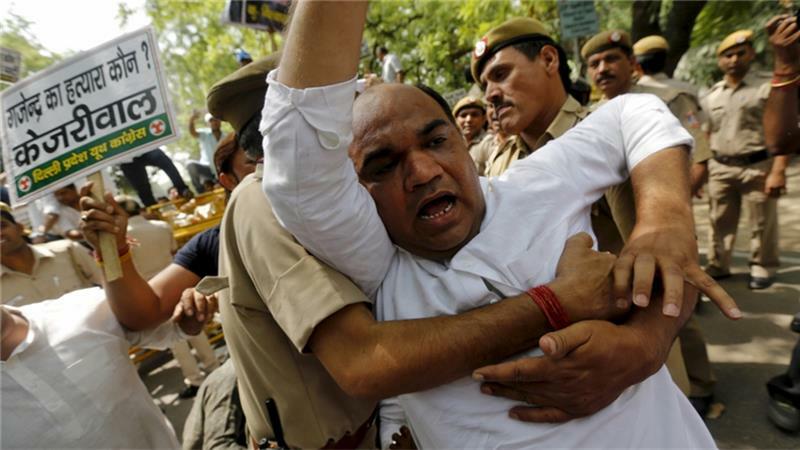 AAP members and especially the Chief Minister Arvind Kejriwal were criticized for continuing the rally despite the suicide happening in front of AAP members, not rushing to assist Gajendra and blaming Delhi police instead. 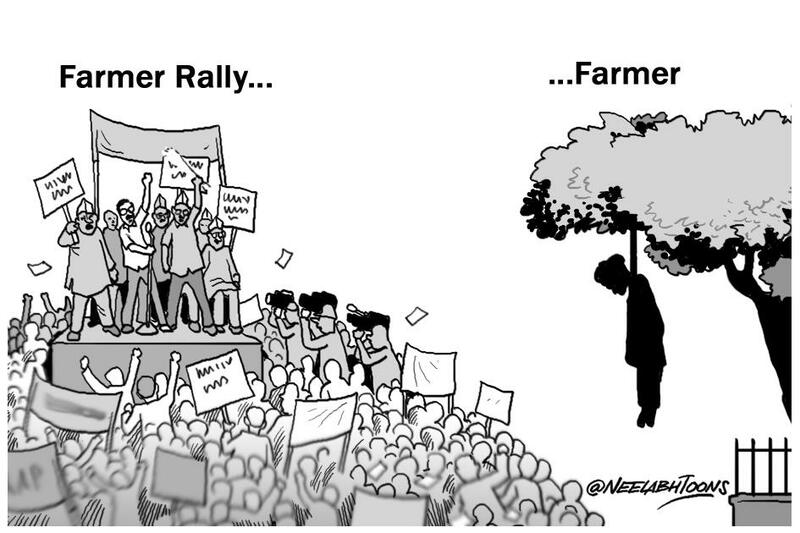 Ironically, the AAP rally was held to highlight farmer suicides and the lack of support farmers get from the Government after devastating monsoons. Farmer suicides have been a tragic reality in India where small-scale sustenance farming is a thankless and miserable profession. Step into any village in India, and most small-scale marginalized farmers will tell you stories of unending debt, failed crops, and unfulfilled political promises. There are nearly 70 million farmers in India. 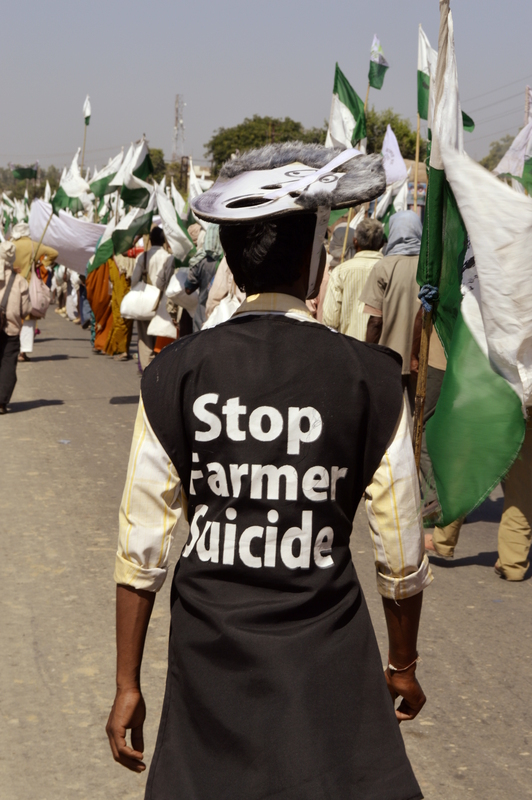 Nearly 10 in 100,000 farmers commit suicide, with a majority in rural areas. Sadly, pesticides that are meant to produce generous harvests, are most commonly used by farmers to commit suicide. From case studies in our own research in Vidarbha region of Maharashtra, we found most farmers requesting their children to give up farming, study hard and move to the city. Farmers told us they want to sell their lands while they could and move to the city to look for jobs. Kerala, Tamil Nadu and Andhra Pradesh suffer the highest farmer suicides worst because of highest proportions of marginal farmers. According to a study by University of Cambridge from 2014, farmers with the highest risk of suicide, posses the following characteristics, explaining 75% of the variability in state-level suicides: “those that grow cash crops such as coffee and cotton; those with ‘marginal’ farms of less than one hectare; and those with debts of 300 Rupees or more”. I had earlier said that the farmers are being punished by the Modi government. I had said that they only help industrialists. This is causing tremendous pain to the farmers of the country. This is sad. But we will do whatever we can for the farmers. We are going to fight the land ordinance. Not to be left behind, AAP blamed BJP, BJP blamed Congress. AAP signed a check for INR 14,00,000 for Gajendra’s family trying to wash of it’s hands off the controversy. BJP largely remains unfazed thanking their stars the farmer didn’t commit suicide during their rally. Farmer suicides largely stem from the Indian Government’s myopic view of the agricultural problem in India. The Government provides farmers with subsidies on agricultural equipment, debt forgiveness during election years, and subsidized credit for agricultural spending. Demand for relief often exceeds the awards from the Central and State Government upon crop failure. Though there is monetary relief announced, corrupt Babus ensure money rarely reaches the neediest of farmers. According to Ramesh Golait of the Reserve Bank of India however, worsening agriculture problem in India is because of “i) poor productivity, ii) falling water levels, iii) expensive credit, iv) a distorted market, v) many intermediaries who increase cost but do not add much value, vi) laws that stifle private investment, vii) controlled prices, viii) poor infrastructure, and ix) inappropriate research”. Therefore, a mere focus on agricultural credit, subsidies on equipment, and debt relief won’t solve the problem. A holistic focus and a more proactive investment on infrastructure support, better use of technology and information, and sustained credit are critical for improving in the condition of marginal farmers. However, credit alone remains the most attractive way for politicians to address the problems with farmers in India. And sadly, until there is a paradigm shift in the debate, more marginal farmers will feel isolated and hopeless enough to end their lives in front of the unhearing politicians. This article was well written and informative. it sadden me. The value of one life is priceless; and that is what makes this situation so haunting for me. I am unsure what can be done but I have ideas and they all focus on what I can do and not what someone else can do. There maybe another occupation requiring different skills for farmers to learn or their children. I teach soft skills and maybe those skills I can offer for free to farmers or children of farmers seeking to venture in other areas as your article suggest. Maybe I can find one a job or give them one when I visit a West Bengali village in May. Surely, I will talk to some farmers during my visit and find out more about what type of help they could handle like microfinance loans or donation of equipment. Last thing I think of is a direct marketing company that teaches life coaching so the soft skills I know I can teach to others and they can in turn teach for transition of next generation into a profitable and beneficial occupation….or even business skills if needed to succeed in another area of farming. These are the things that I think can be done and done by me. When you point a finger at someone there is always five fingers pointing back at you. I believe we should look at any world problem and ask “What will I do?” Only until that question is asked can we be in control over anything being done. I commit to myself that I will commit to helping a farmer. I will try the things in the paragraph I listed above. Maybe one life will be helped by my own efforts….and that would be priceless for me and for that one person. May we all ask, “What will I do?” and not stop asking until we get our own answers.